All our products match and coordinate with each other to create a cohesive organization plan just for you. We understand that the best garage makeovers in Great Falls comes from the use of a variety of solutions that work together as one. We offer our garage shelves and overhead garage storage racks in both Granite Gray and Desert Stone. The Monkey Bar Storage System is powder coated with these finishes to ensure durability. Available in our Graphite Pearl Finish, all of our hooks and accessories are colored to match our Monkey Bar System and Slatwall products. This finish is also available for hardware on our cabinets. Our custom cabinet line is available in a variety of colors and configurations that can be customized to meet available space and storage goals. View all of our cabinet finish options here. Upgrade your garage floor with one of our durable floor options. Both coatings and tiles are scratch and stain-resistant, making them perfect for any garage. 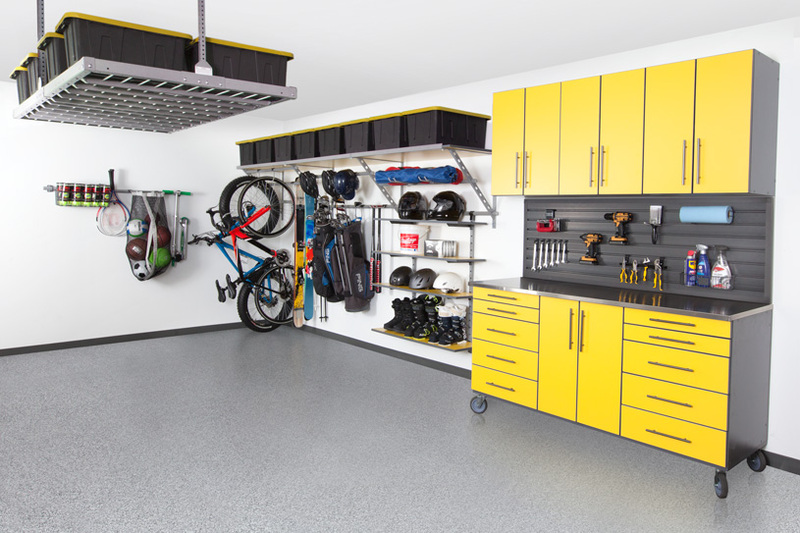 WHY COORDINATE YOUR GARAGE STORAGE? After years of working in the garage storage and organization industry, we've found that the most functional storage systems utilize a variety of products that work together. Mismatched storage systems only add to the cluttered feel of a disorganized garage. 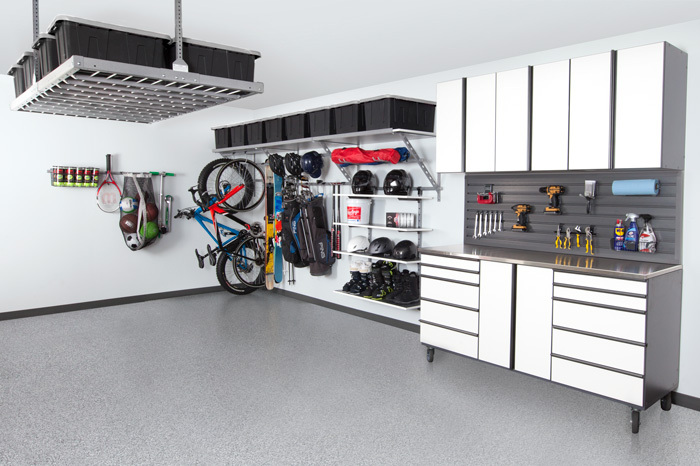 When redesigning a garage storage system, it's important to choose products that are versatile and work in harmony with each other. We provide the industry's most functional garage storage products. Our trained team is ready to discuss your storage goals and guide you in selecting the right products for your garage and budget. We are the exclusive dealer of Monkey Bar Storage products in Great Falls. Monkey Bars produces top-of-the-line garage storage solutions that are leading the garage enhancement industry. Our garage makeovers in Great Falls seamlessly marry design and function. To explore more design and color ideas, check out our line card gallery.